The spirit of our dear Igor left this world on October 13, 2014. He was well into his 50s and had apparently suffered from a stroke or similar health crisis on October 10 that left him paralyzed on his right side. Our wonderful long-time vet Dr. Ohlandt gave him a prednisone injection the following day in the hope that it would do some good. After days of hoping and willing him to recover, it was clear that he was, instead, getting worse and would never be able to move independently again. Last Monday, the difficult decision was made to put an end to his suffering. Igor was beloved by all. Igor had spent 26 years in two different labs, and 27 years at IPPL. I like to think that, on balance, his life had more joy than sorrow, thanks to IPPL’s great animal care staff and our wonderful supporters, who have enabled us to provide the extra attention that he needed and deserved. We think he was born in 1956 or so, in the wilds of Thailand. Most likely, his mother was shot and he himself kidnapped when he was still an infant. Eventually, he was sold to an animal exporter who shipped Igor to the United States to go into research. 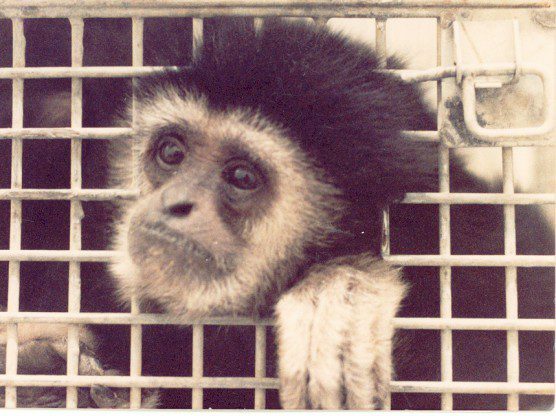 He went to the lab of a pharmaceutical company in the Northeast, then to the now-defunct Laboratory for Experimental Medicine and Surgery in Primates (LEMSIP) in Sterling Forest, New York. Igor at the LEMSIP lab. Unfortunately, at one point in his LEMSIP “career” he developed a bizarre and distressing behavior: he became a self-mutilator, savagely biting his own arms whenever he caught sight of another gibbon. As a result, he was forced to live isolated behind black Plexiglas. Every now and then some of the black coating would get scratched away, resulting in another terrible bout of self-injury. It is currently not recommended that this irritating compound be given to primates, as it can cause excessive inflammation and even tissue damage at the injection site. But Igor was injected with it three times. Worse, he was injected three times in the same location, in violation of proper veterinary practice. It was after this exposure that Igor started biting at the aggravating site on his arm. Somehow (perhaps combined with other stressful situations in the lab), this self-biting behavior started to be triggered whenever he saw another gibbon. He actually arrived at IPPL with freshly-inflicted wounds. In 1987, Igor was allowed to “retire” after his years of service. We built a special house just for him in a remote corner of the property, where he was able to watch the wildlife in the nearby woods. Since arriving at IPPL, he never bit himself once. 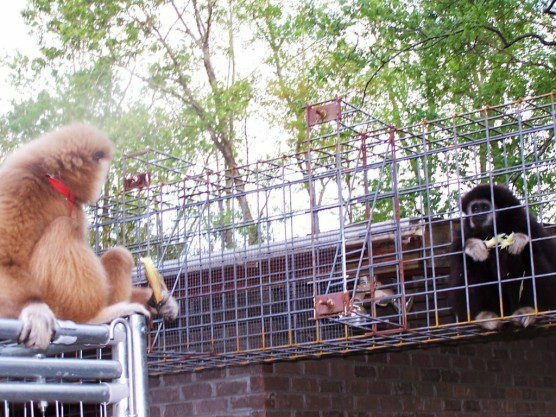 In fact, for years we had plywood visual barriers erected along his aerial runway and outdoor enclosure to prevent him from seeing any other gibbons and avoid triggering any more self-biting episodes. Eventually, one animal caregiver noticed that Igor always left a little pile of droppings just below a seam between two plywood panels, where he would stay stationed for hours in an attempt to glimpse his neighbors Cleon and Louie-Louie. The barriers came down. For over 12 years, Igor had a wider prospect. In fact, since 2007 he even had an unobstructed view of a newer outdoor enclosure that held Michael and now is home to Maynard, both excellent gymnasts. Igor had a special outdoor enclosure built just for him. One of my favorite encounters with Igor occurred many years ago. 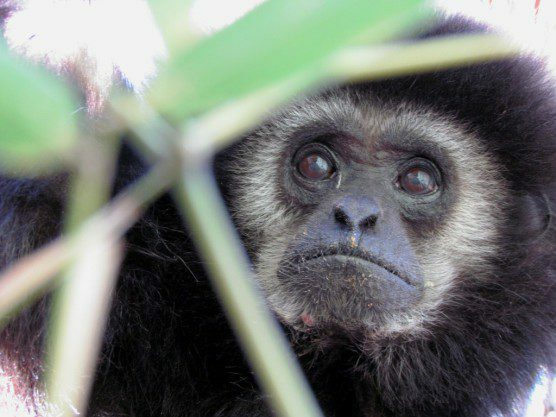 We had a surprise gibbon birth in January 2002 when little Courtney arrived on the scene, despite her daddy’s vasectomy. Sadly, Courtney’s mom rejected her, so she was hand-raised by all our staff. I was her “big sister” and would take her for brief walks and playdates around the property—always with her wearing a harness and long leash to keep her from running into trouble. Igor loved Courtney, and would follow her around as much as his enclosure would allow as she romped about. Igor loved getting visits from young Courtney. One day, I remember clearly, Courtney and I were passing beneath Igor’s aerial runway (connecting his house and outdoor enclosure). It’s over six feet off the ground, and Igor was sitting in the middle of it. As we passed directly underneath, Courtney paused for a moment, looked up, and abruptly executed the perfect jump shot—to poke Igor right in his furry behind! I was aghast, terrified that Igor would get upset. But no! He just looked a bit startled, hardly even shifting his position as he continued to watch Courtney trot away. I thought (once I had calmed down) it was a strong testament to how far he had come! 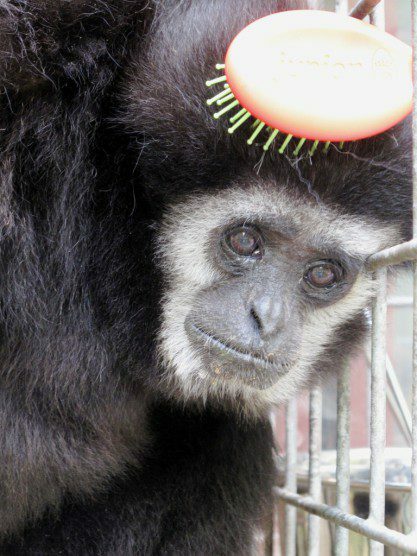 He was by far our favorite gibbon among those we have offered for adoption, and over the past 10 years I wrote many stories about him, with the help of our animal care staff, which we sent off as quarterly updates. Here are some of my favorites. 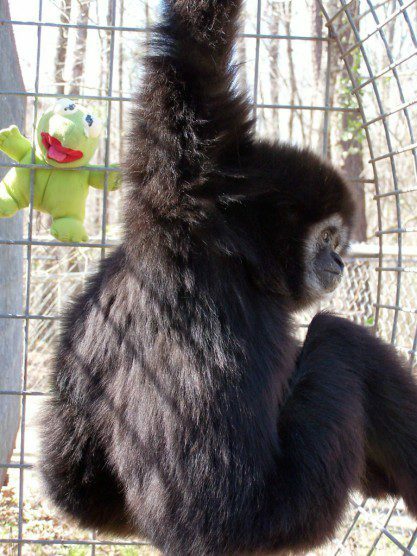 Our animal care staff has noticed how Igor always seems to feel the cold sooner than our other gibbons. Whenever the temperature starts to dive, he’ll begin to shiver before any of the others seem to notice the chill. Perhaps this comes from his living in a confined, stuffy laboratory for 26 years—he probably never learned to adjust to seasonal variations in temperature. But these days he has been nice and active. He likes to wrestle and be tickled through the wire mesh of his cage, and our animal care staff spend half-an-hour to an hour with him each day, making sure he gets his quality time. And if you’re not careful—like our welder, Ed, who was working on Igor’s cage recently—you could find yourself without your hat! Because Igor must live alone due to his psychological problems, we have a TV playing in his gibbon house to help keep him company. We keep it tuned to the local Public Broadcasting/ educational station. On Christmas Day, one of our animal caregivers noticed that the station was airing the Mormon Tabernacle Choir with their special guest, the famous American soprano Renée Fleming, in a concert of traditional holiday music. What made this concert special, though, was that Igor was singing along with her! 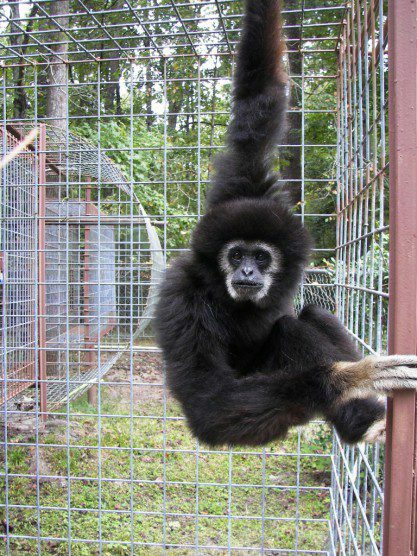 All our gibbons have distinctive, individual calls, but Igor has a unique voice, perhaps from his years of living in isolation in various labs: a trembling kind of “Wah, wah, wah-ah-ah-ah-ah.” Sometimes he’ll do a shorter version of this, which sounds like a throaty chirp. A local newspaper reporter visited IPPL a couple of weeks ago, and she said Igor’s voice sounded like a whimpering puppy. IPPL’s animal care staff think his voice is higher-pitched than most of our other gibbons and has a more woebegone tone. An interesting counterpoint to Renée Fleming! 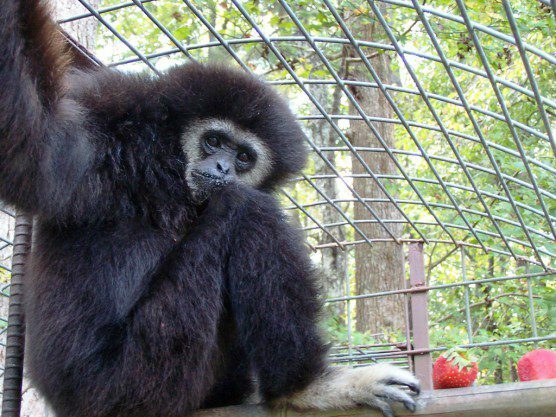 Eventually, the weather turned warm enough to allow the gibbons to go outside again, and our animal care staff was prepared with several big bags of roasted peanuts. In general, our gibbons love the task of extracting peanuts from their shells, but we were unsure of what Igor’s response would be; in the past, he has sometimes been reluctant to shell them himself. In fact, he is often hesitant about eating people-food or anything out of the ordinary. We gave him a handful anyway, and after a while, when the staff came back to check on him, all they found left were shells! Apples were always Igor’s favorite. Igor has a limited number of TV channels he can watch, since we don’t get cable for our gibbons. And although Sesame Street continues to be a favorite of his, for some reason we’ve been getting better reception with the country music station lately, so in the interests of mixing things up a bit, we’ve been tuning Igor in to the music videos on CMT. And we are discovering that Igor likes singing along. Yes, even at his age Igor still knows how to belt them out! Our animal caregiver Meg says that, even though he is singing indoors, she can hear him “over 100 yards away.” And he’s not shy, either; he keeps right on going even when our animal caregivers have a peek inside to see what he’s up to. On cold days, our staff will spend extra time grooming him, one-on-one. He loves this and would gladly stay put and be groomed all day long. After an especially intense session, says Meg, he is quite the fluffball. Is he trying to emulate the styles of his favorite top country stars, like Billy Rae Cyrus’s new ’do? Almost every Monday for the past three years, Igor has received a special visitor. That’s the day when Karen, IPPL’s volunteer gibbon babysitter, brings our three-year-old hand-raised gibbon Courtney to drop by for a visit. Karen and Courtney will stay by Igor’s cage for extended periods of time—maybe several 10-minute sessions over the course of a few hours, sometimes up to an uninterrupted hour or two at a stretch during the morning and early afternoon—while Courtney explores that corner of IPPL’s grounds. Igor remains fascinated by our little one—even if he’s busy watching TV, he’ll emerge from his night quarters as soon as he hears the two of them coming—and he watches Courtney intently the whole time they’re in his area. Igor was introduced to Courtney when she was a pink, virtually hairless baby (looking quite unlike an adult gibbon), just weeks after she was attacked by her own mother and had to be taken away. Maybe he wasn’t sure what kind of creature Courtney was! Igor has continued to tolerate Courtney’s presence very well, even as she has gotten bigger and more “fluffed out.” All the gibbons at Igor’s lab were black in color, but Courtney has developed a lovely honey-colored coat: maybe this has been a helpful factor in Igor’s acceptance of her. While planting a new spirea bush by Igor’s house, our head animal caregiver accidentally disturbed a (harmless) baby corn snake at rest next to a nearby forsythia bush. These beautiful animals have red and orange markings and are relatively rare here. Although the snake gave our caregiver quite a start, Igor was not disturbed at all. In fact, he is very cool about snakes: unlike the other gibbons here, he does not alarm call when he sees one—and his corner of the property sees plenty of garter and chicken snakes during the warmer months. For Igor, this colorful little visitor was a lovely start to his snake-watching season! Over the past two weeks, our animal care staff has been noticing a lot of tiger moth caterpillars in his area. Apparently there are lots of different kinds of tiger moths, but around here these black-bodied caterpillars are just over one inch long. They have pale-orange stripes across their back and tufts of bright orange hairs sticking out along the sides. But clever Igor has figured out how to deal with them! 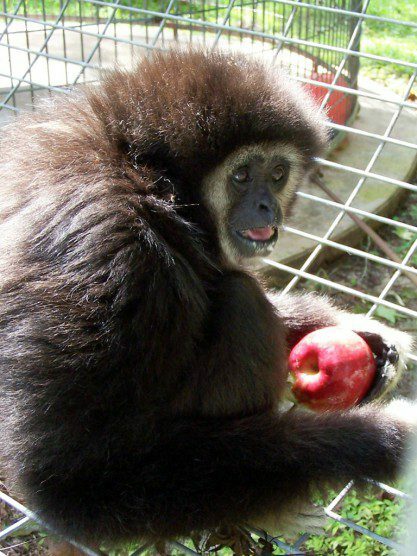 In the wild, gibbons will eat insects as part of their diet, but Igor has not lived in the wild since he was a baby. However, he still has some “jungle smarts.” He has learned that if he pinches the head of the caterpillar first, he can safely eat the rest of it. And that’s just what he does. He’ll be sitting out in the sun in his wire-mesh aerial runway, which connects his house to his outside enclosure, and if a caterpillar happens to come along, he’ll reach out and nab it. So Igor has been getting plenty of extra protein lately: one of our caregivers saw him eat at least three caterpillars in one sitting. Usually Igor is a bit sensitive about allowing certain parts of himself to be groomed: his armpits, arms, legs, and stomach can be delicate areas. But our caregiver Brandon was actually able to groom Igor’s legs the other day—a good thing, as Igor had some leftover sweet potato stuck there that needed to get brushed out. We sometimes tried to tempt Igor with stuffies and such, but he was usually more interested in looking out for his human friends. Igor has been fortunate to receive a good number of visits lately from some of his particular fans—Cheri, for instance, who has known Igor for almost five years. “He is my special love, and I think he knows it!” she says. She has always been touched by Igor’s terrible life story: his kidnapping from the wild as a baby, his years in labs, his resulting psychological problems. “I often have to sit and just sob for a moment or two before I can speak to him, and he watches me as if he knows,” she says. Igor has had some work done on his house lately. Just last month, during a prolonged stretch of good weather (with no anticipated thunderstorms), we had some long-awaited repairs done to Igor’s roof. We locked him into his outdoor enclosure and had caregivers stay with him and feed him treats the whole time so that he would not get nervous. But he seemed to know that the roofers were a good crew of guys who were working for his benefit, and he was pretty relaxed—even when one of them found a harmless little snake hiding in the rafters. The roofing crew was much more alarmed than Igor! He generally seems to know not to be worried when groups of people descend on his quarters to make improvements. (Visiting vets are another matter, of course!) Like last fall, when we had a group of five volunteers from Hagemeyer came out to paint his indoor enclosure a cheerful shade of green. Igor seemed to approve of their work; after they left, he did a thorough inspection of his living quarters, softly “hoo-ing” all the while to make sure they didn’t miss any spots. Igor also liked strawberries and would even eat the green bits! Every day, IPPL staff members spend quality time with Igor. One of his favorite pastimes is “going to the salon.” Our senior animal caregiver has described some of the hairdos she can create with a simple little hairbrush: with a few strokes, she can create a severe-looking military style, a “high and tight” style, or (one of her favorites) a GQ style, with Igor’s hair parted fashionably on the side. Igor enjoys these sessions with his personal stylist. The squirrels love to eat the grape-sized persimmons that ripen this time of year on the tree next to Igor’s house. Persimmons are one of Igor’s favorite seasonal treats, too. It has been fairly breezy the past two weeks, and every time the wind blows, ripe persimmons pepper the ground all around his outdoor enclosure. This is a good thing, because our persimmon tree is maybe 40 to50 feet tall (not like the more petite oriental persimmon trees you may have seen in people’s gardens), so our animal caregivers have to wait for the ripe fruits to fall before they can gather and distribute them to Igor and our other gibbons. Our squirrels do not need to be so patient, and in fact our staff suspects that they are the ones dropping the numerous persimmon seeds on the bottom of Igor’s cage. Lovely tribute to Igor. So sorry he’s gone but so glad he had IPPL. I am so glad you had such good friends at IPPL for the second half of your life. I am sure they will miss you greatly, but with very fond memories. Keep up the good work. Thankfullly for these animals you give them something back. What a moving tribute to a beautiful creature. Thank you, IPPL, for giving Igor a safe and nurturing place to call home. Thank you for posting this tribute to Igor, precious beautiful soul I wish I had known you. Rest in peace. I’m so glad to read this interesting tribute and all the wonderful comments to follow. Igor, knew love in his life.